Good advice all round from Chris I’d say! 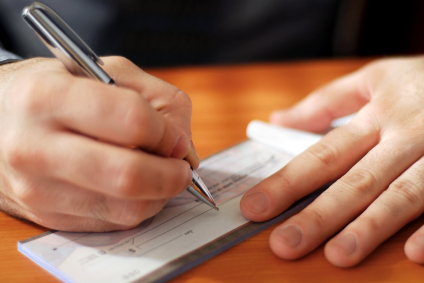 I do believe that the writing is finally on the wall for cheques as a method of payment in the UK – A government committee has recently been convened with the sole purpose of discussing the phasing out of these increasingly anachronistic pieces of paper. Personally, I can’t wait for electronic payments to be the norm across the board. Bring it on! Hi Alex, thanks for the comments. According to this article on the BBC website the government has set a target date of 2018 for the phasing out of cheques – so they may be around for a while, but hopefully not too long! Great Article! We’d definately recommend FreeAgentCentral to help with freelancer accountancy matters. It makes everyones life easier (not just the accountants! ), by allowing easy management of the things you describe above. I know you mention Xero in a different article, we haven’t used that particular service. Be interesting to know what people thought of it. I can highly recommend Xero – I’ve not tried FreeAgentCentral but will give it a go. I’m considering doing a roundup of the popular online and offline accounting applications suitable for freelancers – any other recommendations? FreshBooks, Sage, and Quickbooks come to mind as well as the two we’ve mentioned. Hey Chris, how did you get on with FAC? Did you try it? Think there are pro’s and cons to all services. We love the online aspect due to being able to look at live data in realtime, then offering advice there and then. I’ll have to take a look at Xero. Hi Chris, I’ve been snowed under this week so haven’t got round to testing it – I have however drafted an article for GoingFreelance on accounting packages for freelancers. Unfortunately it’s little more than a few bullet points at the moment! We are offering a micro job service over at 20EZ.com where freelancers will receive payment as soon as the job is completed. I’ve read some of your comments and they are actually very useful. I have started working on a project as a freelance consultant. I have never done an invoice defore. I’m not running a company so I’d like some advice concerning how to create a legal invoice for the services I will provide. Is it OK if I do not include a VAT number once I do not run my own company? How can I be legal in terms of taxation? If you are consulting and charging for your time – you must register your self as Self Employed with HMRC within 3 months of starting work, and submit an annual Tax Return to declare your income. Only include a VAT number and charge VAT on your services if you are VAT registered. You don’t have to be a Limited company to register for VAT, and you don’t have to register for VAT until your turnover reaches a certain point (around £70,000 per year), but you can register voluntarily before then. There is a lot of advice and accurate figures relating to registering as self employed and for VAT on the HMRC website, or you can call them and speak to someone if you are unsure. Good luck with your new venture.